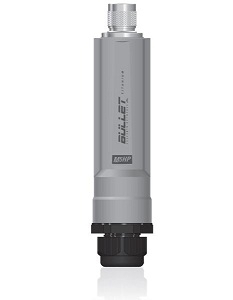 The Bullet™ M Titanium is the latest version of the popular Ubiquiti Bullet. Like its predecessor, Bullet M5 Titanium is a wireless radio with an integrated N-Type RF connector that can be directly plugged in to any antenna1 to create a powerful and robust outdoor Access Point, Client, or Bridge. The Ubiquiti Bullet M5 Titanium features a tough weatherproof design. Made from aircraft-grade aluminium, the casing is designed to withstand nature’s harshest elements. With up to 25dbm of power and enhanced receiver design, the Bullet M5 Titanium is ideal for long-distance links, capable of up to 100+ Mbps real TCP/IP speeds over several kilometres. The Ubiquiti Bullet M5 Titanium eliminates the need to use RF cables and requires no special antenna or tools to install. No radio card / host board issues. No RF cable quality concerns. No mechanical stability concerns. No enclosure mounting requirements. With the Bullet M5 Titanium, operators can just plug and go. The Bullet M5 Titanium is engineered to survive extreme conditions. Featuring an upgraded aluminium casing, weatherproof N-Type connection gasket, and water?tight cable gland, the Bullet M Titanium is virtually bullet-proof. The Bullet M5 Titanium can instantly become a powerful TDMA BaseStation utilizing Ubiquiti’s breakthrough airMAX technology. With airMAX, PtMP networks can scale gracefully while maintaining high throughput and low latency performance. Ubiquiti airOS is a versatile, highly developed Ubiquiti firmware technology. It is exceptionally intuitive and was designed to require no training to operate. Behind the user interface is a powerful firmware architecture that enables high-performance, outdoor multipoint networking. Real-time Energy is shown in real-time as a function of frequency. Ubiquiti airControl is a powerful and intuitive Web-based server network management application that allows operators to centrally manage entire networks of Ubiquiti devices.